The RHS Tatton Park Flower Show is the last of the large RHS shows in the season, but by no means the least, and this year it had an over arching carnival theme. This was my first visit to the RHS Tatton Park Flower Show, and what a show to visit. With a carnival theme across the show-ground this year, an array of stunning colours and colour schemes erupted around every corner, especially in the Floral Design Studio with its amazing floral arrangements. The show gardens at the RHS Tatton Park flower show were somewhat more down-to-earth and within the ‘normal’ person’s reach compared to the Chelsea flower show in particular and even to the Hampton Court Palace flower show. Verbena bonariensis added height to many of the borders and the lovely crisp, fresh white and blue Agapanthus’ seemed prominent in the gardens also. The show gardens came under four zones - Inspire with its innovative designs, Escape with its colourful and relaxing designs, edible gardens in Feast and plant focused gardens in Grow. 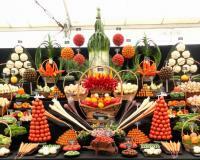 With eleven main show gardens, three picked up Gold, five Silver-Gilt, two Silver and one Bronze. My Garden, which won Silver, was my favourite. The water feature made from car exhausts and powered by a solar panel on the shed roof was particularly inventive. Maggie’s Forest Garden won the best Show Garden award. The six Summer Gardens were all so different. Industrial Transitions won Gold and Best Summer Garden and its use of reclaimed materials complemented by a contemporary design worked very well. The Threatened Islands of South East Asia was also fascinating particularly seeing orchids growing in the trees. A highlight in this year’s show were the Elements gardens, with dramatic and creative designs evoking the four elements of earth, wind, fire and water. With this new garden category, five designers took on the elements and brought an exciting selection of dramatic, conceptual and innovative designs to the show. See the Wind won the Best Elements Garden award, but the one which stood out for me was Elemental by Ian Price and he so deservingly won Gold with amazing reflections in the water and delicate Cosmos growing in through tall grasses. The RHS Young Designer of the Year competition took place at the show where budding designers submitted garden designs along the theme of avant-gardening. The three finalists all did a wonderful job with my favourite being the workOUT garden, which won Gold. A great garden for adults and children alike, providing opportunities for exercising at home, offering a convenient alternative to the gym. The garden showcased bold-coloured planting and a central pond featuring a pedal bike connected to a water wheel, which also aerated the water. A pergola acted as a climbing frame with pull-up bars, but also provided support for a clematis growing through it. This garden was so creative it deserved to win what is was awarded - Gold, although The Sky’s The Limit by Sam Ovens won the Young Designer of the Year 2014 competition. With the carnival theme of this year’s show there were certainly vibrant floral displays in the massive RHS Floral Marquee. Full of colours and smells and as everything was nicely spread out the displays aren’t on top of each other, giving them all chance to show off. The Bonsai display, show of clematis’ and the amazing display of show vegetables by Medwyn’s of Anglesey were well worth a look. I loved seeing the start of the WorldSkills UK Landscape Gardening Competition. The final eight students had 22 hours over three days to build a garden to a fixed design. It certainly tested the skill sets and capabilities of the competitors. It was also great to see the wide range of Flower Beds showcasing the talents of local authorities and communities from across the UK. The School gardens were beautiful colourful gardens too from the next generation of gardeners with the schools choosing either a book or literary theme. To me this show had a feeling of a provincial country show, with various demonstrations taking place throughout the show-ground such as dry stone walling and willow weaving. Children could try blowing bubbles using a willow wand, or adults could Have a Go at allotment gardening, where you could drop in at any time to get hands-on experience and pick up top tips on growing your own produce, from digging to sowing. The show felt spread out, so there was a great feeling of space and openness. However, as everything was within easy reach, you seemed to come across show gardens all the time tucked away in and around the site. This is a great show to stop and take breather, soaking in the atmosphere whilst admiring the lovely park land setting. The show also had a feeling of friendliness, warmth and with the mixture of great plants to buy, food, shopping, crafts and gaining tips, ideas and thoughts for your own garden; it’s a great day out. Check out photographs from the show on our Facebook page. Published on 24 Jul 2014 and Filed under Reviews.